The energies of Mercury planet in the North direction are supportive in a karmic way to help you develop the ability to plan and manage your finances and communications in a productive way. This means that positive Vastu adjustments in this area are shown to improve your income and finances. The North area of your building is very important because this is where the vital magnetic, female energies of the Earth flow from its centre, and into your home or office. This energy circulates within the building after meeting in the Northeast with East male, electrical energies of the Earth. Here they combine to provide balance and harmony in any given space as they travel around the building. Open up your energy field in the North of your home and create a light, clear and clutter-free environment. Avoid using the North for heavy or bulky storage. If there are no windows or doors in this area you can open up the space with the use of a large mirrors on the North point of the wall. Using Vastu floor plans, a Vastu consultant will help you choose the best location for main entrance on your plot or building placed in the North. This also attracts money flow. Communicate more and better to stimulate your cash flow by placing a flowing water feature in the North. If this is not possible you can use images of water cascading down through a green environment. Use of green decor and gemstones of Jade, Peridot or Emerald are well placed here and can they also be activated with the Buddha mantra. Small green potted plants helps to encourage positive bioenergetics of plant life. Invoke Lord Buddha in His yantra and place it on the North wall of your room or property. Faithfully chant His mantra and install the Buddha yantra. Meditate and be open to receive an abundant cash flow. With these changes you should soon see improvements in the flow of wealth into your life, however benefits to be gained through these adjustments go far deeper than just accumulating money. The green Buddha yantra represents the heart chakra of the Vastu Purush. Here we can open our hearts to sharing, loving and communicating. Didi, how do i invoke The Budha yantra and how does the yantra looks like? Thank you for your question. 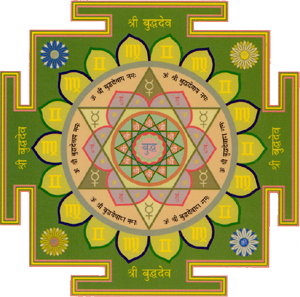 It is vital to know how to invoke the all the Avatars within the Vastu yantras. The essential ingredient is chanting Their respective mantras, which are composed of Their names. When you call for anyone’s attention, you call their name; for Buddhadev His mantra is : Om Namo Bhagavate Buddha-devayah. Since you are already a devotee of Sri Krsna, you understand the importance of approaching the Lord in a devotional mood. Once showered and in clean clothes, on a Wednesday or any other other auspicious day, early in morning or at noon, you can sit in front of Buddhadev yantra, face East and place it on a table with a clean cloth and meditate upon Yantra. 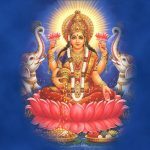 Chant His mantra and offer Him incense, ghee lamp, flowers and fruits etc as you would in a puja and make your declaration, expressing your desires to Him. You can make your heartfelt offerings as simple or elaborate as you are able. Whether you recite mantras 3 times or 108 times daily, it’s your personal choice, but the effort you put in this yajna (sacrifice) is usually directionally proportional to you being in receipt of your desired results. After this initial installation, you can chant for 45 days daily and the Buddhadev yantra will be fully activated. If you are fortunate He may be pleased and give you His direct audience!